just in case I get shot or blown up tomorrow. but also because the sidewalk’s really uneven here, slabbed. 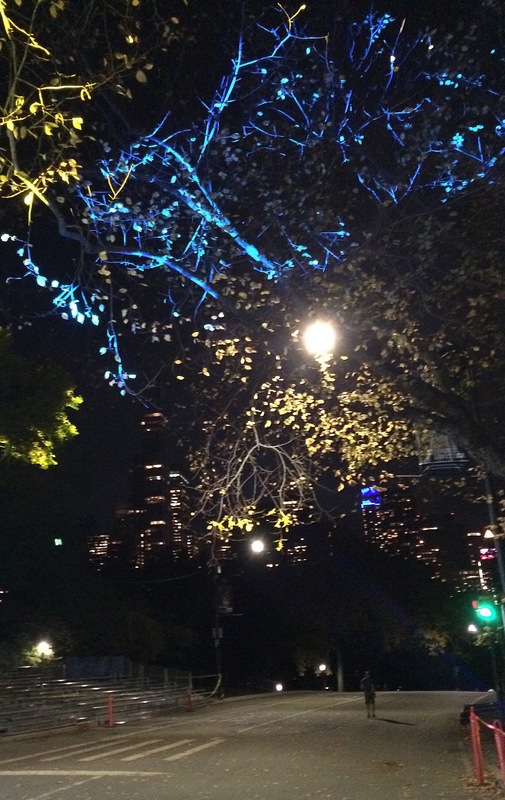 The pic was actually taken by me a few weeks ago, showing light shows that were done before the NYC Marathon–not the neon squares of glass I write of, but cool pics, I thought. All rights reserved. This entry was posted on November 20, 2015 at 8:56 am and is filed under New York City, poetry. You can subscribe via RSS 2.0 feed to this post's comments. Ha! Thanks. I felt the raccoon–the whole story–was just too crazy and long–it is a very detailed story worth writing of in its own right– and yet I also felt that it was the most fun part of the piece so hated to take it out. Glad you liked it, and glad that it moves along smoothly along not to be a pain to read. Thanks again. k.
What I appreciate most about the poem, is the freedom created by stream of consciousness, so apt when considering how too many lives are being restricted by fear and images of slaughter, flashed all too blood-thirstily over every media outlet available. We live in terrifying times, good to remain calm at centre, remember that pregnant raccoons can thrive in hostile territory. I enjoy the concept of a book holding one’s hand and as Kerry mentions, the stream of consciousness…powerful, K.
I like how your poem seems to wind it’s way, meander like a path through an English Garden (and a pregnant raccoon definitely fits there).. and those thoughts about people’s skin color we still carry within… I think this way of going straight by also looking to the sides is so real.. I think this is my very favourite of your poems yet, kiddo. It is simply beautiful, rats, racoons, the man with sunken cheeks who would have certainly kept you from falling……….and the wanting of your words to live on, as do we all. A gorgeous write. Thank you so much, Sherry. k.
A prose poem to cherish or sure, & yes, I agree your urban pride, & survivalist’s attitude just shine, piercing the darkness, muffling the gunshots, stifling the screams. I love the recurring preggers raccoon; it symbolizes something. Long after we are gone, cockroaches, rats, & raccoons will inherit the cities. New York has known different and even perhaps greater personal hours of fear–no one cared to risk walking anywhere in the city back in the ’70s–but since 9/11 the shadows have been darker, haven’t they? The peril in greater magnitude to the sharpness of fear. Walking now in the dark there I imagine (as reading here) one writes these last letters of instruction to the living and the loved, treading with one’s footsteps so amplified (great detail). The paradox I get in the lead picture, the hidden thread in the carpet that leads us out, is that the night above the walker is so magisterial, that the world of the dead is nothing really to fear but is the welcome of all of those manuscripts. My take anyway. Such an engaging read, Karin. Thank you, Brendan. I am honestly not so fearful at this point, or maybe used to that sense of it–the lucky thing about the City is that long-time denizens are typically not very fearful of the things that strangers may fear– It is very strange, though, as an older person, remembering prior eras, to walk through the Park at night–Central Park–I do do it quite often, but usually just certain angles, etc. and often with a little catch in my throat, though honestly, there are people about even when it is very very dark. Thanks for your lovely poem. k.
I enjoyed this so much. Like walking through the park with you as you think out loud. It has a bit of an undertone of anxiety yet determination to still live and hope for the things we care about and desire. I don’t know how to voice what I am feeling at this moment … I was there, beside you, behind you. And I thank you for writing this. Karin, I love this piece, relate to this piece, feel myself inside of it, being someone who wanders around Midtown allowing the kind of free association you unleash here. It’s wonderful. The care of raccoons, that IS charming. The certainty of stumble and being caught. It’s all really tactile and great. Well, thank you, Marian. K.
Ok, honestly, this is something I could read for hours. What a wonderful rhythm, you think it odd, but it has such a real feel to it. The refrains in parentheses are wonderful and such a glass block window into the other side, the real thought. You know I love refrains and shadow voices. Just a great piece of writing, makes me so glad I came up with this prompt. Thanks for playing!!!! Thank you so much, Corey. Your writing of the prompt was so special–your word pictures tremendously seductive. Much enjoyed. k.
I came the other day when you left me the link and I could not get past the first verse. It was painful to read, mainly because there was no hysteria-inducing tone but a calm and almost casual remark. Tonight I have finally read it all and I loved it all the more. The way you control the pace of it is incredible. Thank you so much, Michael, and for all of your kind comments. I really enjoyed the idea behind dread (not) and the execution. K.